I wrote a song. Not only did I write a song, but I came up with the chords and lyrics all on my new guitar, something that impressed me and my friends. My husband, Steve, was the only person who was not surprised by my sudden interest in all things musical. He's the one who took me guitar shopping for my birthday last November and he's the one who kept saying, 'you're a poet, you should write songs'. Every time he'd mention the songwriting idea, I simply chuckled to myself. Thinking, I can't even sing, let alone write a song. When we went guitar shopping, I noticed there were several people who like to hang out at guitar shops and show off their skills. Then there was me; I'd pick up a guitar and play the handful of open chords I knew very well. At Jensen's in Santa Barbara, the small shop is very laidback and the owner, Chris Jensen, showed me all of their inexpensive guitars before busting out the big guns. Even before hearing the Martin Road Series, I knew it would be a guitar I would be super happy with. The beautiful rose wood had a dark red body. It was love at first strum. The guitar sounded just as rich as it deep mahogany color, like a fine wine and chocolate all rolled up in one perfected instrument. Last March, I wrote my first song on that guitar. You're probably wondering just how did that magical moment happen. I had been putting the final touches on my latest poetry manuscript, Bird Forgiveness. It was a Saturday when I walked down to the Santa Barbara Roasting Company. That coffee shop always has a long wait. You could do an errand while you wait for them to pour your coffee into a paper cup, but Steve likes it. While I was reading Casa Magazine, the first lines of the chorus floated before me. I took out my pen and wrote the lines on the magazine. I had no doubt that I was writing a song, partly because I heard the melody in my head. The words were familiar to me because they were based on my poem, 'What the Birds Know' from my new book. Because the poem is now associated with the Bird Forgiveness book, the line I kept hearing was, 'because forgiveness begins with a bird, flying high, flying high, waiting for a lonely hand to say goodbye, say goodbye, say goodbye'. I had a chorus and two versus. Now, what? Steve advised me to grab my guitar and work out the chords, something that sounded like a very tall order, but ended up working out like a charm. I chose the key of D because I was learning a Bob Dylan song in the key of D, 'Don't Think Twice'. Because I heard the song in my head and had chosen an easy key with all open chords, when I finished the song, I recorded it and wrote everything down to make sure I wouldn't forget it. Two months later, I recorded myself playing my song on my new guitar. It's a great feeling to see one of my poems turned into a song. I look forward to writing more songs. I know I will be able to write more songs because I had the same anxious feeling about writing my first poem. I was worried that I wouldn't be able to write another poem. Three books later, I can assure anyone who wants to write or learn guitar that secret is daily practice. Special thanks to Susan and Dennis Chiavelli for hosting the location of these videos and for their hospitality. Although I'm noticing several hiccups and mistakes in both the video of the poem and the song, I'm leaving them here for viewers. How many poetry books have their own theme song? As a lover of birds, I am a lover of Bird Forgiveness. As a lover of poetry, I love these poems because though beaked and winged, in pain and in joy, they also take flight out of their occasion. With a focus on birds, the world is renewed, and the poet reminds us it is we who need forgiving. Melinda Palacio's birds touch us everywhere they fly: from the drowning of a homeless woman in Audubon Park to the oil spill damage to a duck. Like the birds she loves and mourns, Melinda Palacio migrates her songs between two coasts, Gulf and West, Latino and Anglo—and she asks for the poetic freedom birds have. Sometimes the poems appear as near sonnets, sometimes in utterly free shapes, but always this is a book of fierce mourning for the birds that fall at our feet and for a grandmother who dies under her watchful care while caged birds quarrel. In the end Melinda Palacio sets all her birds free, and we remember what birds and poets have most in common—their wild song. How wonderful to think that Melinda Palacio is writing poems so delightfully human, so unexpected in their movements from wit to profundity, so uncompromisingly honest. Who else would recognize a bluebird as Elvis? Who else ask birds for forgiveness? Her finest book yet, Bird Forgiveness is a work of great modesty, invention, and abiding respect for all the living world. masterfully explores confinement, liberation, freedom, and flight. 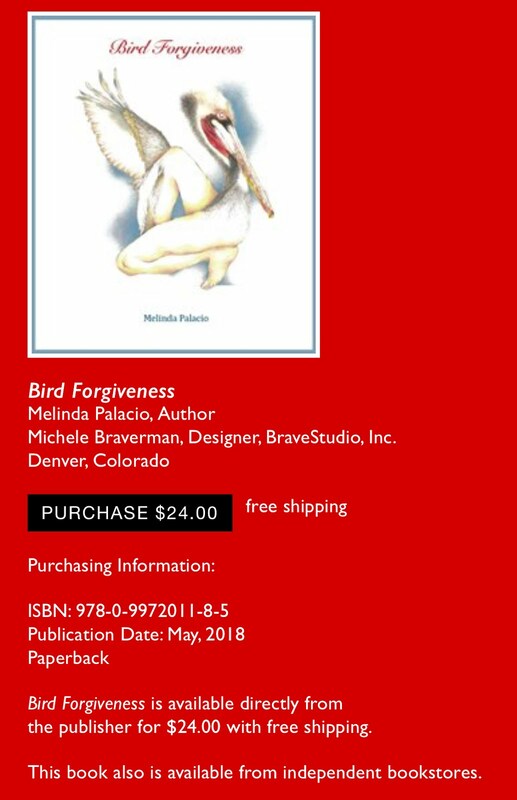 Abundant joy and wonder run through the poems—from the harpy eagle, to a bluebird named Elvis, to instructions on how to wash a duck—and they examine human behavior and relationships with wisdom and grace. This is a delightful, unforgettable book from a marvelous talent at the top her game. Happy Saturday. If you are reading this today, May 19, come to the La Bloga panel at the Pasadena Lit Fest at 5:30 pm at the Andalucia, 686 E. Union St. Bring any comments or questions. Beautiful!! So proud and impressed! I was singing harmonies in my head. Very excited for your book--!! I'll order a copy today. What a delightful article in La Bloga. We are driving from Taos to Denver and I read the article aloud to my husband Bill. We both enjoyed it and even more, the song. Atta girl! Poetry is song; song is poetry.